This is the heart of the John Heartfield maquette (the original from which his poster and magazine covers were reproduced). He created this stunning work of art using tools such as pieces of photos, paste, and scissors. Placed on a black background, it’s cropped as he indicated the photomontage should appeared on the cover of the AIZ magazine. This image remains as relevant today as it was in 1933. Bigotry leads to blind and broken justice. A blind and broken sense of justice often leads directly to war. The montage is a commentary on the “trial” following the burning of the Reichstag. Many believe the Reichstag fire, blamed on groups such as the KPD (German Communist Party) and the Jewish community, was orchestrated by the Nazi Party. The fire was an important political component of Hitler’s rise to power. John Heartfield’s powerful photomontage The Executioner and Justice was an indictment of the 1933 Reichstag Fire Trial. The trial’s defendants, political opponents of the Nazis, were accused of being complicit in sparking the blaze. Heartfield’s stunning image was an integral part of the international campaign to expose the Reichstag Fire Trial as a Nazi conspiracy to discredit opposing political parties. With surgical precision, Heartfield’s collage exposed the unjust nature of the German justice system. Because Lady Justice is a universally recognizable symbol, Heartfield chose a ravaged version of her to convey his message. Traditionally, Lady Justice is blindfold to indicate objectivity and impartiality. 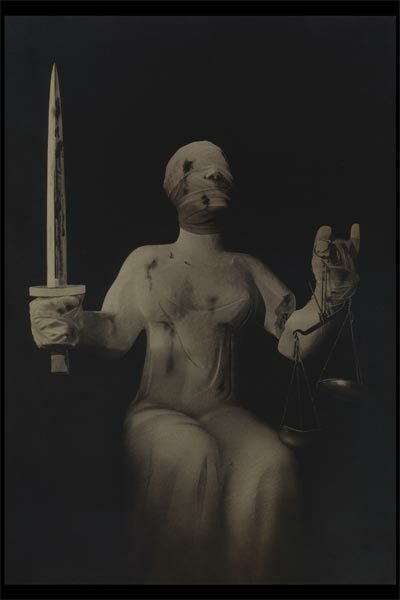 However, the eyes of Heartfield’s Lady Justice are bandaged. In German, to be bandaged (verbunden) can also mean to be aligned. The bandage in Heartfield’s political montage implies Lady Justice is aligned with a particular side. The German justice system had already undergone its first massive cleansing when Heartfield created this famous photomontage. In April 1933, the Civil Service Law excluded communists, Jews, Social Democrats, and other undesirable civil servants from government service. The Law on the Admission to the Legal Profession outlawed the admittance of Jews to the bar. It’s worth noting that a third of the female lawyers in Germany at that time were Jewish. Marie Munk and Margarete Berent, along with many others, were advocates for women’s legal equality. The Civil Service Law and the Law on the Admission to the Legal Profession made it virtually impossible for an entire group of women to find fair representation. By choosing Lady Justice to be the centerpiece of this political masterpiece, it’s entirely plausible that Heartfield intends to comment on the wretched state of justice for German women. It’s a strong visual suggestion that injustice follows when women are gagged. It was the Jewish artist Hella Guth who sat model for Lady Justice. Hella Guth is known for a series of woodcuts for Brecht’s Threepenny Opera. She was also an activist and campaigned for refugees in Czechoslovakia. She showed her work in a refugee shelter in Prague and published a series of protest postcards. At least one of them aimed to support the accused of the Reichstags Fire Trial. The caption of the montage reads: The Executioner and Justice. Underneath in smaller print: Göring at the Reichstag Fire Trial: To me law is something gory. Everything about the words, including the font selection, is meticulously arranged to underline Heartfield’s message. On December 23, 1933, Dimitrov, Popov, Tanev, and Torgler were acquitted. Marinus van der Lubbe was sentenced to death and executed on January 10, 1934. However, the goal of the Reichstag Fire Trial was achieved. Hitler rose to power on the waves of the Nazi propaganda surrounding it. Heartfield’s warning on the power of political fear mongering remains as relevant today as it was in 1933. His intense political art could easily serve as a cautionary icon for the world’s current judicial imbalances and legal deficiencies. For example, Heartfield’s corrupted Lady Justice could serve as a symbol for the overcrowded and racially imbalanced prison population in the United States. Indeed, Lady Justice is suffering wherever institutional justice is unfairly applied around the world. The political masterpiece The Executioner and Justice remains a stunning reminder of the ability of those in power to impose their brand of justice upon vulnerable members of society. The Reichstag fire took place on February 27, 1933, one week before the Reichstag election that made Hitler chancellor of Germany. The fire was crucial for Hitler’s accession to power. It was a perfect excuse to implement the Reichstag Fire Ordinance the next day. The ordinance suspended major democratic rights, such as habeas corpus, freedom of assembly, freedom of the press, freedom of speech, privacy of correspondence, association, and phone calls. It gave the police the power to search houses without a warrant and confiscate property. Offences like arson became punishable by death.In 1933, Hitler’s SA and SS members operated in plain view as auxiliary police. In effect, this amounted to a takeover of the government’s police force. Goering’s position as minister of the interior of Prussia put him in control of Germany’s largest police force. In April 1933, Goering established the Prussian Secret State Police in Berlin to investigate “political crimes.” The police and the SA jointly set up the first concentration camps such as Dachau and Sachsenhausen. Famous German citizens such as Erich Mühsam and Carl von Ossietzky were sent off to Sonnenburg concentration camp as early as 1933. These events were not secrets. They were reported in the international press. Hitler’s opponents were arrested. Among them were opposition lawyers such as Alfred Apfel, Ludwig Barbasch, Felix Halle, and, notably, Hans Litten. In 1930, Jewish lawyer Hans Litten had subpoenaed Adolf Hitler in connection with a storm trooper attack on the Communist Eden Club. For hours, Litten brilliantly cross-examined Hitler, who had claimed to denounce violence. Litten’s tactics and perseverance eventually exposed Hitler’s actual agenda. It was a short-lived victory. Litten was arrested when Hitler became chancellor and died in a Dachau concentration camp. The BBC production The Man Who Crossed Hitler (or Hitler on Trial) dramatized Litten’s story.Within the first days after the fire, several thousand people were taken into “protective custody.” In effect, an arrest not requiring judicial review or a warrant. Detainees were intimidated, beaten, and tortured. There was a public outcry when Egon Erwin Kisch, Carl von Ossietzky, and even Reichstag deputies were arrested.In March, the Law to Remove the Distress of the People and the Reich was passed. This law, also called Enabling Act, relinquished the legislative power of the Reichstag to the Reich government. The law abolished the separation of powers. It meant that new laws came into effect only one day after their publication in the legal paper Reichsgesetzblatt (RGBI). To handle the corresponding judicial load, twenty-six special courts for minor political crimes were established. The lawsuits were farcical. To make matters worse, convicted defendants had no right to appeal.The world followed developments in Germany closely. Internationally, there were rumblings of boycotting Germany. The international press compared the Reichstag Fire Trial to the Dreyfus affair. It was speculated the fire might have been the work of the Nazis. The Legal Commission of the International Investigation Committee held a Counter-Reichstag-Fire-Inquiry in London. In August, 1933, the Brown Book of the Hitler Terror and the Burning of the Reichstag was published.The Nazis, fully aware of the international attention the Reichstag Fire Trial attracted, carefully used it to their own advantage. The trial took place from September 21 to December 23, 1933. This gave Hitler time to present his new order as law-abiding, above-board, and ethical. He was able to create a scenario to discredit the hated communists and suspicious foreigners.In order to boost their version, the Nazis employed state-of-the-art technology. The international press was able to film within the German Supreme Court. At first, the trial was broadcast live on loudspeakers outside the court and on the radio. However, this ended when defendant Georgi Dimitrov (director of the Comintern’s Western Europe office in Berlin) managed to corner Goering and turn the tables. The sheer number of required laws un-balancing the system meant addressing the number of fair laws that need to be adjusted. New laws were drawn up, interpreted, and implemented by legal experts who were professionals and knew precisely what they were doing. Apart from everything else, these laws created work. For example, the July, 1933, Sterilization Law, made famous in the film Judgment At Nuremburg, required the establishment of Genetic Health Courts and Higher Hereditary Health Courts. These utilized eugenic and racial policies. Over the years, their judges ordered the forced sterilization of more than 400,000 people. Many of the victims of this law, mostly women, died. The Nazis considered this an acceptable outcome. The ease and rapidity with which civil rights could be revoked and courts be turned into kangaroo courts is a timeless warning how quickly justice can be perverted in the name of law and order. THE JOHN HEARTFIELD EXHIBITION SHOP offers exclusive items, including Posters, T-Shirts, and Mugs featuring classic John Heartfield antiwar photomontages. This timeless image of a blind and broken Lady Justice is as relevant today as it was in 1933. Profits from The Heartfield Exhibition Shop support The Official John Heartfield Exhibition and the development of an Online Museum For Progressive Political Art.